"It's not a story, it's a case!" It's been a while since I reviewed a major film in theaters. Truth is, I haven't really been pressed to see anything out lately. But I've been waiting for the release of this movie ever since I heard about it a few weeks ago so I took myself to the theaters to see it this afternoon and was really impressed. As we leave behind one of the most controversial and talked about political regimes in our country's history, it seems like the perfect time to see a film about a corrupt political scheme. 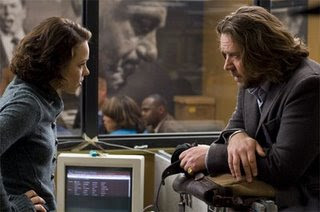 State of Play is the political thriller that follows investigative journalists played by Russell Crowe and Rachel McAdams who link a string a murders to one of the biggest news stories to ever rock the city--the sudden murder of a Congressman's mistress. As the pair sink deeper and deeper into the case, they find themselves competing with the police to find the killer and smack in the middle of a dangerous investigation where their own lives are at stake. No one is who they say they are and the facts change from person to person. I'm not going to give away all the twists and turns in this movie (you'll be guessing 'til the very end! ), but I can tell you I really enjoyed it. It was good to see Ben Affleck, who played the Congressman, back on top again. He was convincing as the heartbroken yet tough Congressman with a dark side, reminiscent of his character in Hollywoodland. Russell Crowe is great as the news hungry wise-talking journalist, and Helen Mirren kills it as the no-nonsense matron of the newspaper. This film was well worth the wait.